In the 1970s, chemist James Lovelock and microbiologist Lynn Margulis formulated one of the most well-known hypothesis on the ecosystem of planet Earth: they proposed the idea that every life form is linked with one other, communicating and sharing statuses of being that contribute to shape the one and only super organism whose name is Gaia. The so-called Gaia theory was for sure the reflection of the rising awareness by First World nations for the influence of humankind on the ecology of the planet, eventually resulting in foundation environmentalism movements such as Greenpeace. 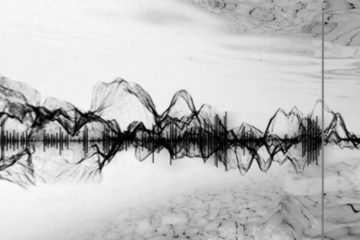 These themes have been studied by many artists in the second half of 20th century and it’s definitely not surprising to see that in recent years many scientists, artists and writers have found themselves working around the Anthropocene question. Men and nature, men are nature, man or nature: these are just some of the most recurrent questions at the center of German artist Simona Koch’s research. Since the early years of last decade, she has worked with various media seeking to make connections between living creatures and to show them as a whole, as an organism. She has exhibited in many international group shows, developing several works and side projects that deal not just with the aforementioned themes, but also with politics, history of humankind and psychology. Filippo Lorenzin: Looking at your projects I can see some reoccurring themes and before I start asking about this I’d like to ask you if and how your studies in Graphic Design and Illustration have influenced your late artistic research. 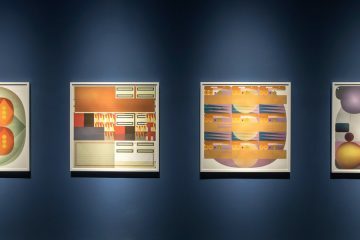 Simona Koch: Yes, I am sure those studies have influenced the aesthetics of my artistic work – though the more conceptual part has developed when I studied Free Art. Filippo Lorenzin: As I mentioned before, you work on some reoccurring themes. For example, City series (2007) (http://www.en-bloc.de/en/) revolve around the dichotomy between rural and city life, showing utopic scenes. How did you get interested in these questions? Moreover, is there any specific aim? I mean, should audience react in some specific ways? Simona Koch: When I started creating the photo montages of the series City I was driven by the thought that humankind is in fact a part of nature – therefore I started imagining a world where urban and rural spaces have no contrast. At that time, urban gardening became also more and more popular – like the beautiful project Prinzessinengarten (http://prinzessinnengarten.net/), founded in Berlin in 2009. I don’t expect a specific reaction from the audience, but I am happy if people reflect on the effects of overpopulation and the ongoing destruction of nature, if they are inspired to think about new forms of cohabitation. In 2014 one of my scenarios was reconstructed in public space for one day in cooperation with City Theater Ingolstadt in Germany and local garden centers. The center of Ingolstadt city was covered with soil and bark mulch; plants were brought there and a little lake was created, sheep were kept in a preserve, fireplaces were installed and we even built a waterfall. The visitors were using the space in a totally different way from the usual and really enjoying the utopian situation. Filippo Lorenzin: I have another question about City series. You’ve worked on many different cities (Moscow, Tokyo, Berlin, San Francisco and many other) and I’m wondering how the history and differences of each of them have affected your works. Simona Koch: Yes, the history of the cities has sometimes an influence over the sites I choose and how I “equip” the renderings. For example, in City – Moscow / Red Square (2010) (http://www.en-bloc.de/en/city-moscow). 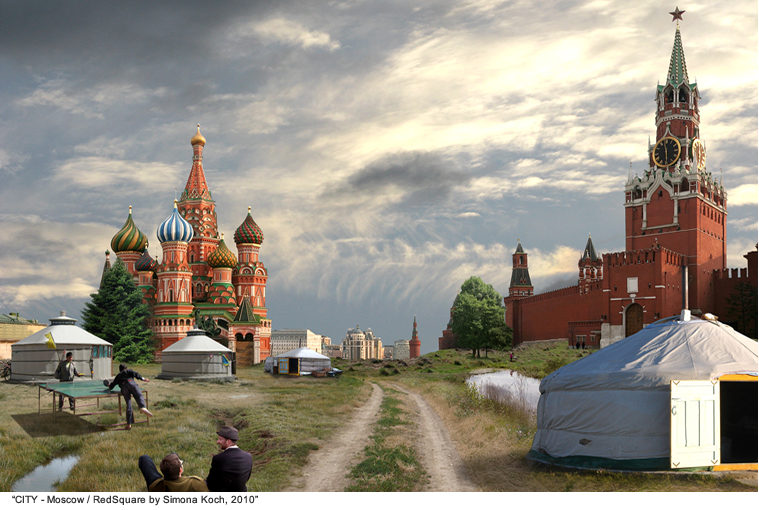 I placed yurts, as a reference to the nomadic tribes that were incorporated in the Russian Empire. Anyway, I rather aim to create parallel worlds with speculative histories. The images also reflect my own life: the objects I use for the compositions have been taken by myself in many rural areas. For example, Uzbek men play chess in front of Brandenburger Tor; vegetable patches from Tempelhofer Feld in Berlin have been placed on the Maidan in Kiev and a woman from a market in Kyrgyzstan sells here eggs at Place de la Concorde in Paris. Other footage I used was taken in China, Iceland, India, Japan and Bavaria. Filippo Lorenzin: Fascination for organic and artificial life is another recurrent topic of your research. 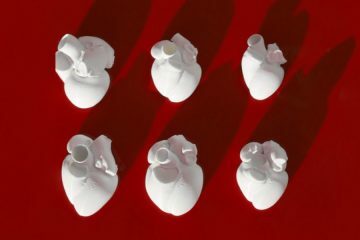 The ongoing series Organism (2008) (http://www.en-bloc.de/en/organism) takes in account many various questions regarding this topic, from the creation of self-sufficient systems to the depiction of organs and skins. How can such a various range of projects can be grouped under the same title? Or, what is the focal point of all these works? Simona Koch: The works in this series are all dealing with different aspects of biological life and questioning its boundaries. With Organism 1 / Animalis (2008) (http://www.en-bloc.de/de/organismus1). I have reduced life to its basis and developed an organism that exists only for the purpose of being self-sufficient. There is also the Abiotism series (2012) (http://www.en-bloc.de/en/abiotism) with works dealing with life forms that have nothing in common with the scientific idea of life. It’s a series of projects that refers to animistic conceptions of the world. 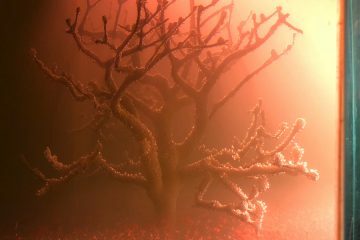 All these different projects on organisms, made with different media, represent a single attempt to reveal the mechanisms behind the world. Filippo Lorenzin: Superworld (2015) (http://www.en-bloc.de/en/superworld) is another project revolving around the depiction of organic forms. The scientific look seems to really fascinate you in this and many other works: what is the reason behind this? 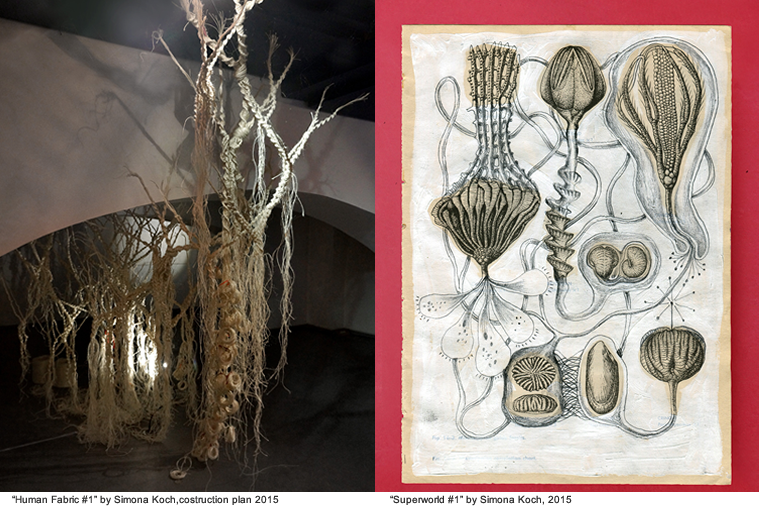 Simona Koch: Superworld, as well as many other projects of mine, was originated by the feeling that everything is connected – and this is what the drawings show. They are made on the pages of scientific books, an operation which enables me to transfer the initial scientific meaning into something more speculative and poetic. I started the series during an Artist-in-Residence stay at National Centre for Biological Sciences in Bangalore (https://www.ncbs.res.in/) where I was in contact with many researchers of different biological disciplines. 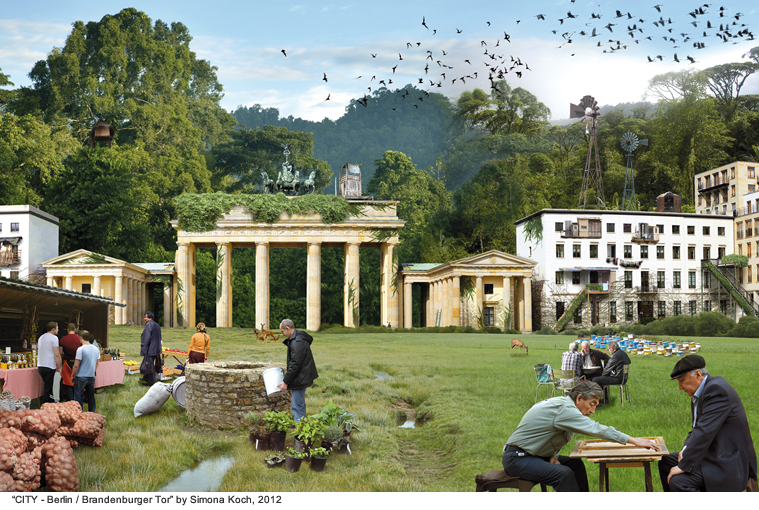 During the stay, I was focused on the project Superorganism – #1 Bengaluru (2015) (http://www.en-bloc.de/en/superorganism-bengaluru) which refers to the hypothesis that cities can be seen as superorganisms. Therefore, I used maps of Bangalore drawn in different times in history, animating them with pencil drawings to show the growth of the Superorganism. 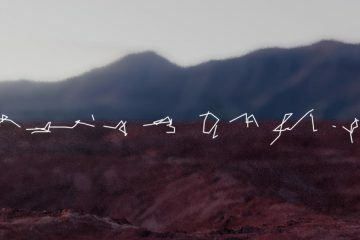 This animation is part of a complex installation. Filippo Lorenzin: In recent times you worked on geo-political questions with Borders (2010)(http://www.en-bloc.de/en/borders). This project makes an interesting connection between scientific representations of the world and expressionist ways to depict it – to be more precise, the pencil drawings. Could you tell how this project did start? What are the implications you would outline? 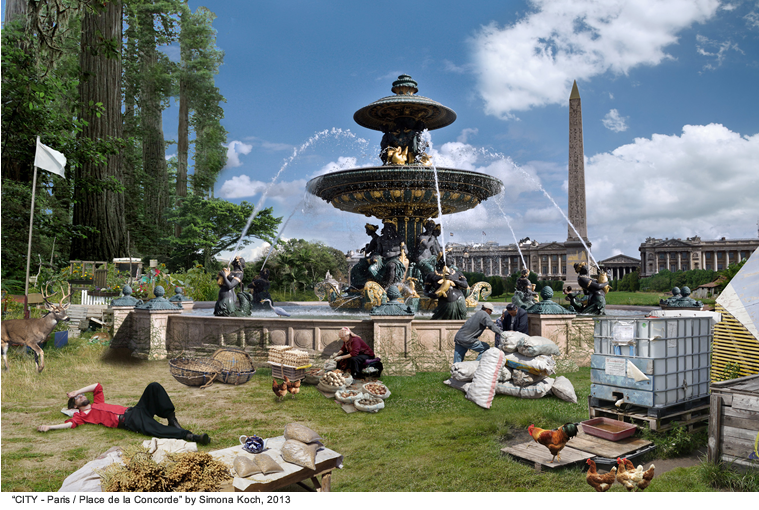 Simona Koch: With the Borders series I show the historical shifting of national borders of various places in the world. I had been thinking about this project a long time before I started it – and it took a long time to find the right maps. At that time, I was fascinated a lot by the behaviors of organisms and by similarities in how they interact with environment. I guess Borders shows an interesting aspect of mankind by observing them from above and in another timescale – like some kind of insect or microbes. Borders presents the tragic absurdity and instability of nations, tracing also a process that is occurring permanently everywhere: organisms always claim territories as their own. By taking distance, the cruel history of war and shifting of frontiers turn into movement patterns of territorialization. 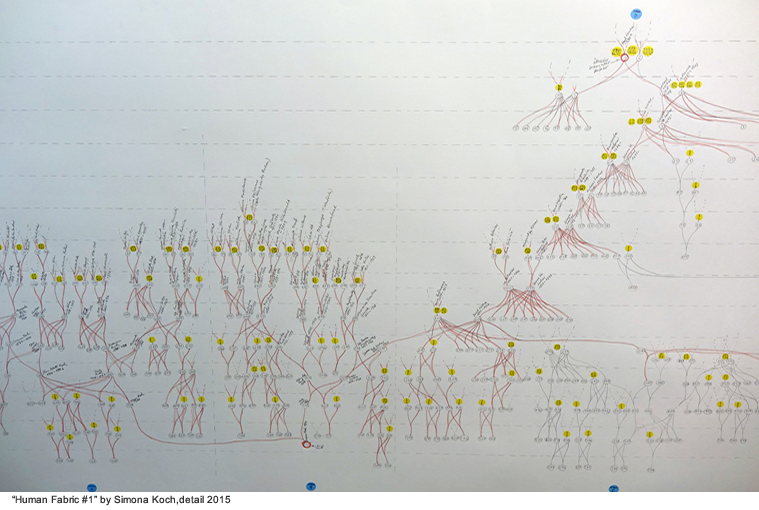 Filippo Lorenzin: Human Fabric (2015)(http://www.en-bloc.de/en/human-fabric) and Essentia (2008) (http://www.en-bloc.de/en/essentia) are in a way quite similar to Borders: their basis is scientific but the outcomes are quite expressive and intimate. I can see a tendency in your research to bring scientific questions closer to private life – am I wrong? Simona Koch: The projects you refer to, do indeed have similarities. With Human Fabric I work on the invisible genealogical net that connect mankind – like a section of the “human mycelium”. 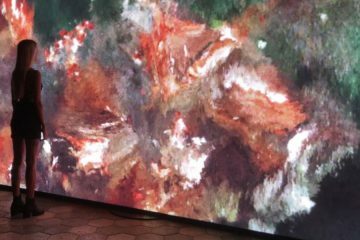 Essentia is an installation in which video projections show essential actions and occurrences in life like harvesting, eating, giving birth, interacting with other life forms, and so on. Many of my projects revolve around the idea that single actions and occurrences can be seen differently from a higher point of view. I am fascinated by the idea that everything is related to each other and with my projects I make essential but invisible processes and structures tangible. To come back to your question, I don’t intend to bring scientific topics closer to private life, but I work on some of them because they relate to wondrous and essential questions. Filippo Lorenzin: What are you working on in these months? What plans for 2016? 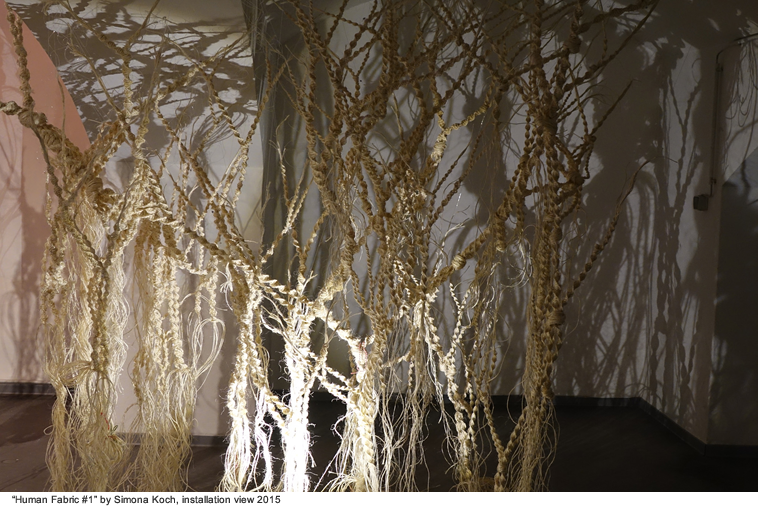 Simona Koch: Because of Human Fabric project, I am translating the information of my own genealogy into a sculpture. This work in process is made with macrame-helix technique. At this stage, its dimensions are 4x4x3 meters with 10.000 meters of sisal rope connecting about 500 individuals. The family bush is growing back in the past but also spreading horizontal to all sides. Theoretically, I could include everybody into this net of relations if I had information on how the person is linked to me. I recently received some information on further links for this family bush so I will be very busy in the next months.